See more objects with the color dimgrey saddlebrown slategrey silver darkslategrey or see all the colors for this object. This is a Textile. It was manufactured by Vlisco. It is dated 2009 and we acquired it in 2015. Its medium is 100% cotton and its technique is wax-resist printed on plain weave. It is a part of the Textiles department. Vlisco is the last remaining European manufacturer of “Dutch wax prints,” the vibrantly patterned cottons worn throughout western Africa and the diaspora. In the art and design world, they have been made well-known through the work of artist Yinka Shonibare, who deploys them frequently as a commentary on colonialism. But they remain, for many, a symbol of authentic African-ness. These types of fabrics were originally designed for the Indonesian market, the wax-resist process a mechanized version of batik. 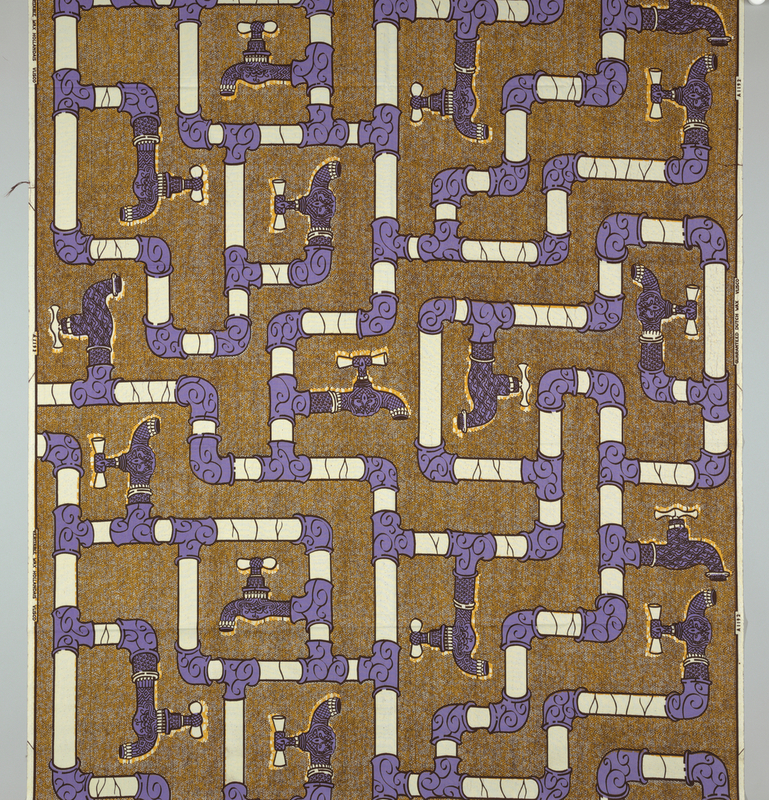 The fabrics found a more receptive audience in West Africa, and over time the design and coloration was adapted to this market, although effects unique to the wax process, like crackle and bubbles, are still apparent. The designs are created in the Netherlands through a unique collaborative process with traders—primarily women who run the open-air markets where the fabrics are sold. The traders can get an exclusive on a particular design or colorway, or suggest themes for designs. They also assign names to the designs, which may give them particular local resonance. From the mid-19th to mid-20th century, Vlisco was one among many competitors in this market, with major centers in Mulhouse, France and Manchester, England. Today the competition comes primarily from China, with printed copies. But Vlisco’s dedication to the traditional wax-resist technique, along with consistently high-quality and innovative designs, has made the “Vlisco Real Dutch Wax” label into a global status symbol. It is credited Gift of Vlisco.